As some of you may have seen in my previous posts I really enjoy chairmaking. Now that my busy summer is over, I'm up for the challenge of designing a chair, as all the chairs I've made up to this point have been made with a purchased plan and with supplied or directions for templates. I want to do this from scratch, the design, the templates, the joinery, and the details. There are many #s and angles to consider, some more important than others, but these details depend on the complexity of the design and some become more instinct as you do more chairs. So to start I need to determine what type of chair. 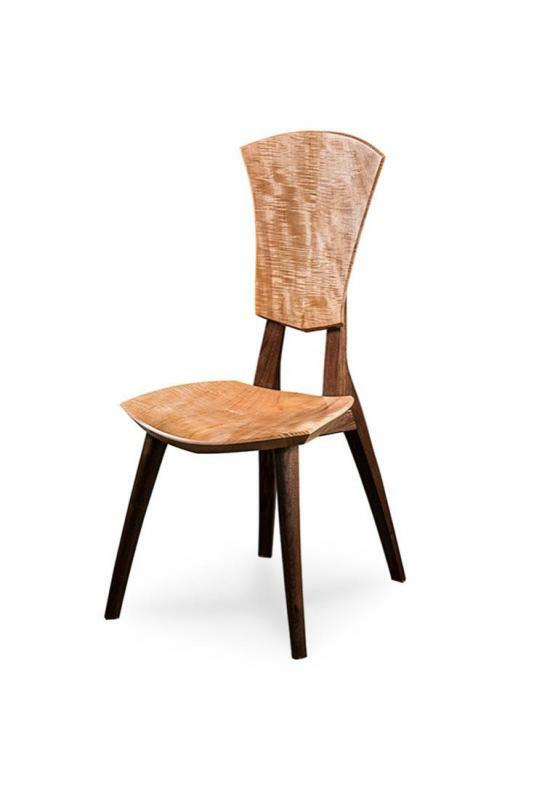 I've been attracted to solid wood chairs, no upholstery, caning, etc. This type of chair also fits into my skill set, shop equipment and lumber stock. I want the design to be fairly straight forward but have the option to get more intricate if the prototype works out. Finally, I don't plan to build a plywood prototype, I'll build it with quality lumber understanding I may need to adapt on the fly. For inspiration I did some searches for some designs that were attractive to me and were good starting points for the design. Here are some photos that got the creative juices flowing for this design. 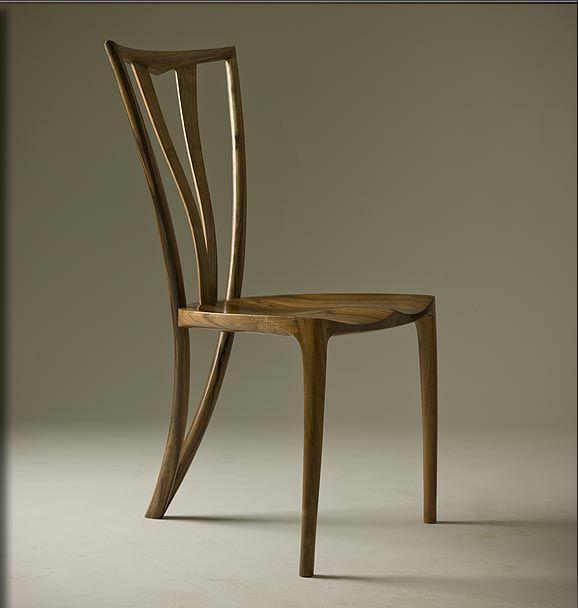 This was a very unique design, I actually really like the uniqueness of this chair, in particular I like the shape of the backrest. Not sure it the spindly backrest supports would hold up though. This next design is fabulous, totally love this design. I'm not sure of the designer/builder but I think I will try to do one of these in the future, but not this time. In my design I'll look at trying to copy some of the curves in these legs and front leg to seat joint placement. 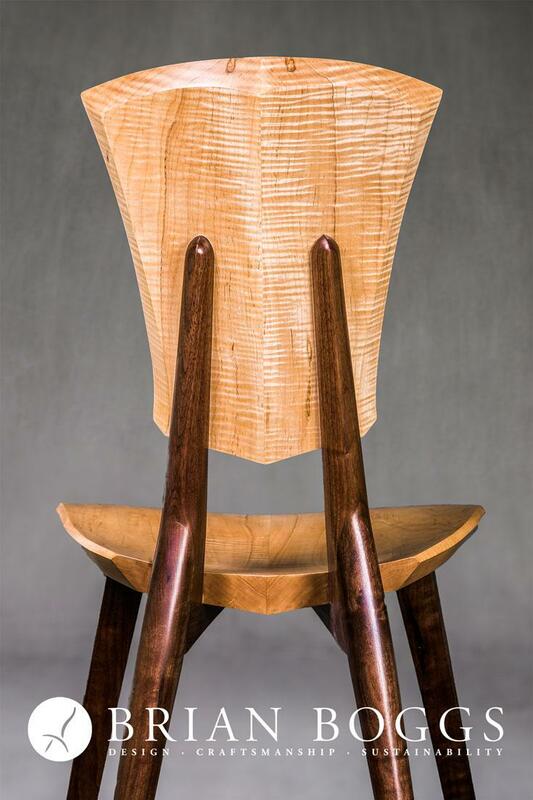 I love the flowing simplicity of this chair. Here are 2 other great designs, both by Robert Erickson. 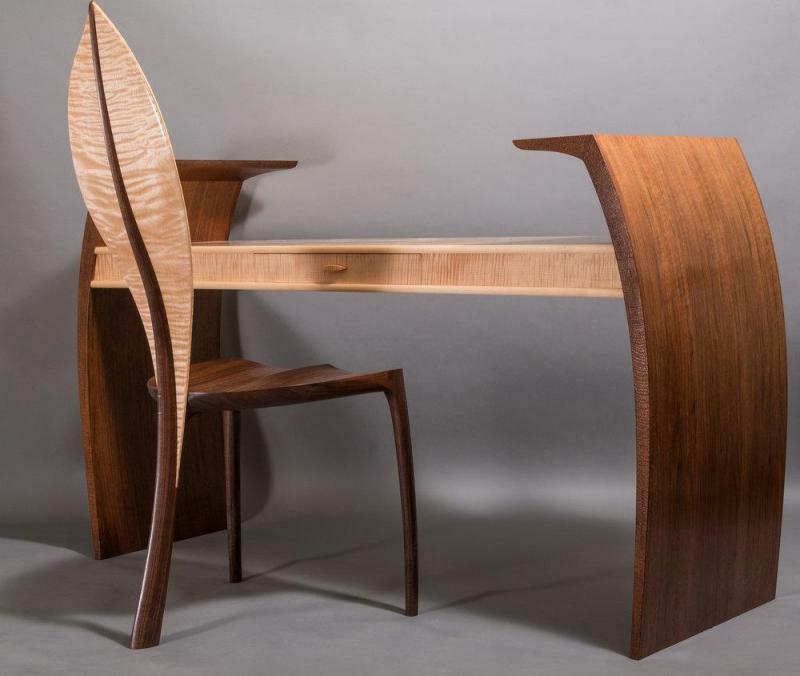 Love his curves and bent lamination work. He tends to be less rounded/sculpted, more curves with square edges if that makes sense. What I love about these 2 designs are the arms, there are simple and clean. Now these following chairs are what I'm going to base my design off of. 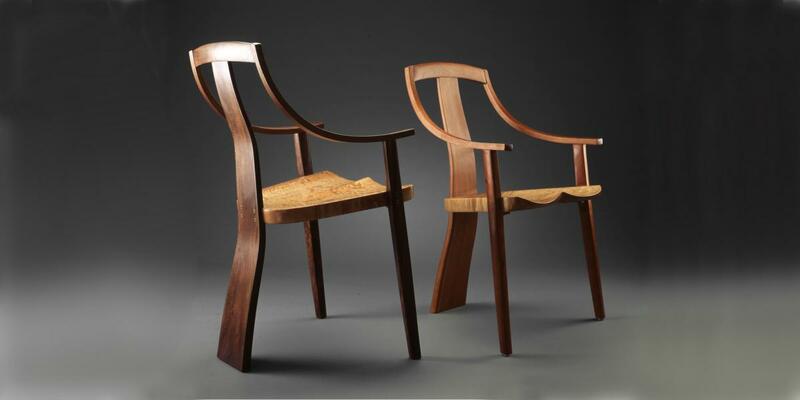 These are 2 chairs by Brian Boggs, elegant and beautiful. I like the general shape and form, it's a shape and form that I can envision different designs from. I would like a front leg to seat joint out at the edge of the seat, not into the underside of the seat. Also want a more flowing shape to the legs and less angular backrest. I'm in the process of developing the plans the old fashioned way with pencil and graph paper. I should finished with the first draft to the point of posting these plans in the next day or two. As always feed back is welcomed and encouraged as I go through the design process. Can’t wait to see this come together! I was impressed by your previous chairs. 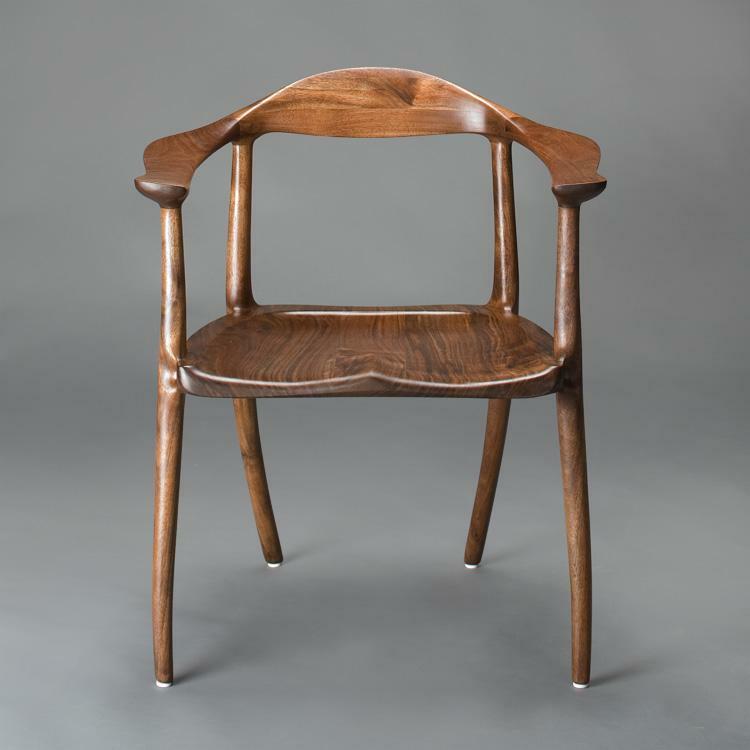 I’d love to make a chair one day, but I already have a long list of projects and I’m pretty intimidated by the idea of making chairs. It may be just the low-res image, but I think that first chair, with the 'spindly' back support, may actually have metal for those supports. I seem to see joint lines at the seat and backrest, and a lack of grain in the spindles. Makes me think of bronze. I like it too but sure as shootin' some guy is going to try to rock back on the rear legs, I mean leg. If they do, it will be a ride to the floor. I agree, that visually is my favorite of the bunch, I will keep that filed away and make something like that in the future. What I really loved about this is the sweep and curves in the legs, also the legs look slender and refined, it's this look I want to try and get in the chair I'm designing. Agree can't lean back in that one. Almost looks more like a show chair. one that everyone says how neat it looks but no one sits in it. Those two chairs in the 4th photo will take a lot of bent lamination, but they do look sharp. I have some rough plans and drawings worked up. I by no means am an expert, so don't take what I say as gospel, understand I'm coming at this with limited experience. Some of what I'm saying is more from study than experience. To start, you have basic measurements you need to follow with chairs. Seat height is typically 17"-18.5", seat width and depth is typically around 20", angle of seat to backrest is typically 5-10 degrees, and angle of pitch in seat is typically 3-5 degrees. I'll be staying within these numbers. The look I want is a lighter look with an uplifted appearance to the seat, a deeply shaped seat bowl, and a rounded sweeping look in the legs. I'll be coopering the seat and the backrest to help achieve these looks. I think the seat to leg arrangement is going to be straight forward with this design, the backrest will be a little tricky and I may mock this up prior to making the backrest. 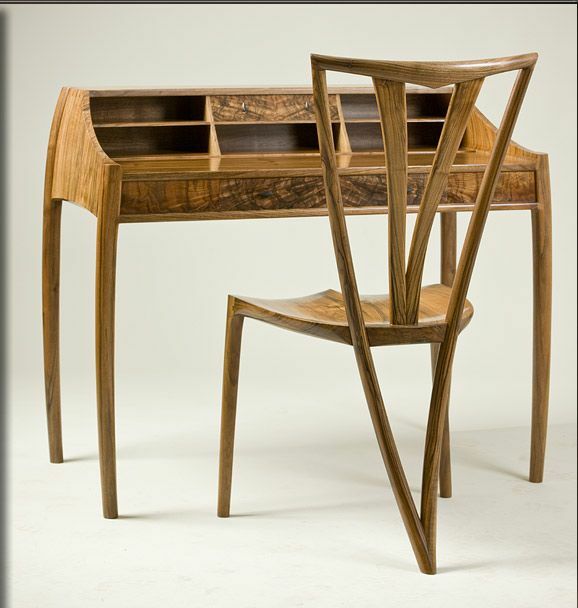 This solid wood design makes the joinery much much easier and the shaping helps blend things together and hide flaws. Joinery will be Maloof joints for all leg to seat connections, this is a joint I'm very comfortable with and is a nice joint visually. The backrest to back leg joint will be a long grain to long grain glue up with screws. Seat will be coopered, I'll plan on 4 blanks, three joints, 6 degrees at midline joint and 6 degrees on outer joints. The back of the seat where the back legs join the chair will be angled 13 degrees at the midline. This along with the 6 degree coopered seat will give a slightly angled look to the back legs and a more interesting look to the back of the chair. The legs will have some significant sweep to them. I've sized the blanks to accommodate these curves. I may add to the sweep with a cut and glue technique as I see how they look. Back leg construction and shaping will be tricky as I will need to develop a perfectly flat surface at the correct angle for the glue joint to the backrest. I'll need to make a jig to cut this at the perfect 10 degree angle. The backrest will be coopered to 13 degrees and will match the 13 degree angle cut into the back of the seat. Matching this angle should allow me to get parallel gluing surfaces for the backrest and the back legs. The backrest will be shaped significantly and the shaping will produce a nice hollow area for the upper back and a slightly pronounced lumbar support area. I will use 8/4 stock for the seat and legs. May be able to use 6/4 foe the backrest if I glue up 4 pieces with coopering at all joints. What are you making, the chair out of walnut? No walnut in this chair, but maybe in a future chair. Plan to use maple (Norway Maple) for the seat and backrest, will use cherry for the legs. I've got some nice wide maple planks at 10/4-9/4 that will work well. If I like how the chair turns out I may make a set for our family dining area, if I don't like how it turns out I'll design another. Thank you Derek for that piece of information. That design is stunning. This is known as "The Chair" or "The Round Chair", and was made famous when Kennedy and Nixon debated the presidency on TV in 1960. It was actually designed in 1949. I built one with hand tools a few years ago. David's forte is bending wood. You will see many curves he creates in his work. Super nice guy. I corresponded with him some time back as I was interested in building his desk (the one I posted earlier along with his chair). I think it is stunning. I do not generally copy the work of others, so I shall have to design something along those lines. Routing the rabbet, I hate using a router and I find I have much more control with a starter pin on a router table. then finish by cleaning up the cut with the router plane. A few things to notice with that last picture is the back legs splay out below the seat and splay in above the seat, that is from the 6 degree coopered joint at the midline. As for the front legs I don't notice the more subtle 3 degree splay, maybe I will when the legs are shaped. Hope to get the leg shaping done next, and there will be some tricky parts to that in regard to the back legs as I need to make sure the backrest fits them. The front legs should be very straight forward. That's looking cool! Nice job! You make this look effortless. I'm going to have to come back here when i have more time and am going to attempt something sculpted. Go BMAC! Looking good, I am already starting to feel the end result. Thanks, I am getting quicker, but we had a rainy weekend in the Mid-Atlantic region so I got some solid time in the shop. I find when I'm working on a project I'm excited about the time seems to not matter (as I'm sure most of us can relate to). The Maloof joint, esp using the paired router bits, is a pretty straight forward joint with a little practice. Bmac, don’t play! He will have the chair done in a few hours. I need to build dining room chairs, but the table first. And some other tables and a desk before that. And some mud room cabinets. And a second list.... 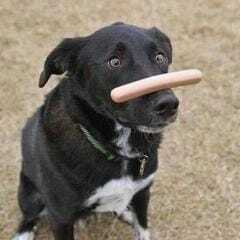 I envy your skills, it looks great! Finished work early today and got a few hrs in the shop. Likely my last hrs for the week as I'm headed up to Cape Cod to surffish. I decided to start with 5 degrees and adjust from there once I got the backrest made. So I think that looks pretty good, maybe alittle too much flair in the shaped front legs but I'll see if I can blend that in some as I go. It fits the other backrest the same but I couldn't get both in the photo. Now you can see from this photo that the angle is pretty harsh and I need to shape this into a curved profile. I have two choices, see what I can do with these thinner boards or get some thicker boards to give me more room for shaping. Well I want the backrest to be thin so I'm going to try and shape these. This brings me to the first possible change for any future chairs, I may need to decrease that back angle of the seat so I can use bookmatched pieces for the backrest. We'll see if shaping can pull me out of this. Next steps will be shaping the backrest and using doublesided tape to put it in place and test out that backrest angle. I am totally digging this series, Bmac. I eagerly await further progress. And I envy your ability to get it DONE.